Who says Women entry in Sabarimala not allowed? Lord Ayappa May Forgive Us. Supreme Court bulldozes gender barrier at Sabarimala temple, allows entry of woman devotees. A five-judge bench by 4:1 majority passed the verdict in favour of women devotees. Chief Justice Dipak Misra, Justices R F Nariman, A M Khanvilkar, D Y Chandrachud were unanimous in their opinion. Justice Indu Malhotra gave a dissent verdict upholding the practice. 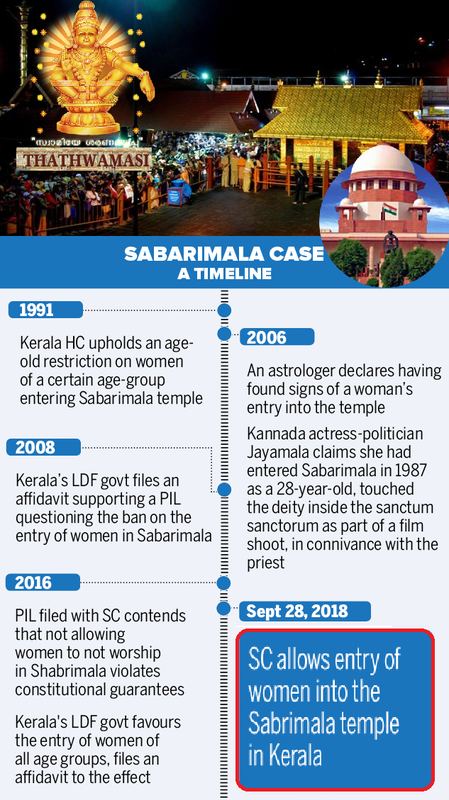 Amit Anand Choudhary | New Delhi | TNN | Sep 28, 2018:: In a landmark verdict to ensure gender equality at religious places, the Supreme Court on Friday opened the door of Sabarimala temple in Kerala to women devotees and held that century old practice of not allowing women in age group of 10-50 inside the temple is illegal and unconstitutional. A five-judge bench by 4:1 majority passed the verdict in favour of women devotees. Interestingly the lone lady judge on the bench Justice Indu Malhotra gave a dissent verdict upholding the practice. The court held that all devotees are equal and there cannot be any discrimination on the basis of gender. Practice of barring women in age group of 10-50 to go inside the temple is violative of constitution principles, said the apex court. The court said that dignity of an individual cannot be made subject to mob morality and religion cannot be an excuse to deny woman right to worship. The majority verdict also said that menstruation status of a woman cannot be a ground to deny a woman from entering a temple. Such practise is against the dignity of woman and not allowed under the constitution, the court said. Justice Indu Malhotra, however, said that what constitutes essential practice of religion is to be decided by worshippers and it is not for the judiciary to adjudicate. She said that notion of rationality cannot be invoked by court to examine validity of religious practice and came to the conclusion that worshippers of Sabarimala temple constitute a separate religious denomination and they are entitled to continue with their essential practices which includes not allowing women in 10-50 age group to enter the temple. (Reactions and Pics are not the part of TOI report). 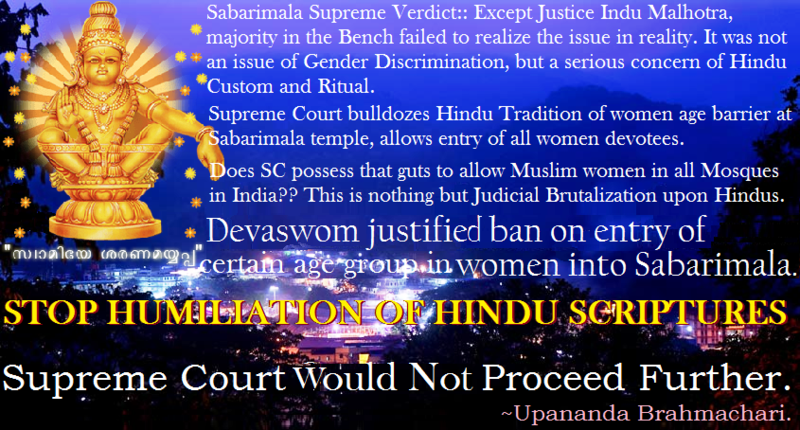 This entry was posted on September 28, 2018 by hinduexistence in Anti-Hindu, Attack on Hindu Sentiments, Attack upon Hindu Sentiment, Hindu Religious Issues, Hindu Rituals, Hindu Tradition and Culture under attack, Hindus are attacked under Indian Polity and Judiciary and tagged Sabarimala Temple entry issue for Women, Supreme Court allows entry of woman devotees in Sabarimala, Supreme Court bulldozes Hindu tradition in Sabarimala, Supreme Court of India.